So many people have asked us what they can do for us during this time. Here is a link to help you: http://herviewfromhome.com/9-things-you-can-do-instead-of-ask-what-you-can-do/ It's too hard to come up with something and it feels bossy at times. The community that has risen up around us has astounded but we also understand life has it's own pain and sometimes we can't show up for each other. 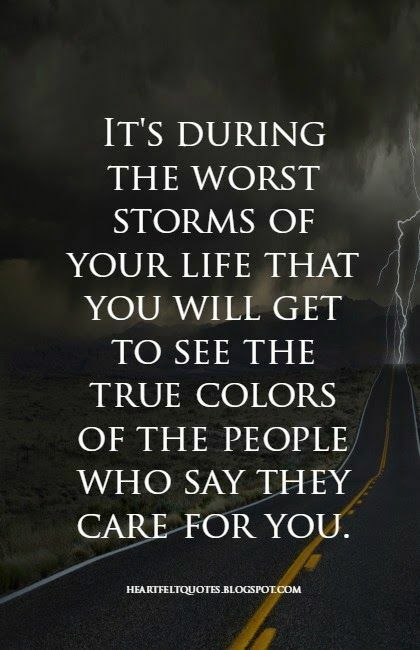 That is ok. To those who feel helpless or are going through their own trials- we still value you and you give us so much in varying ways. Please don't feel guilty as guilt destroys relationships. 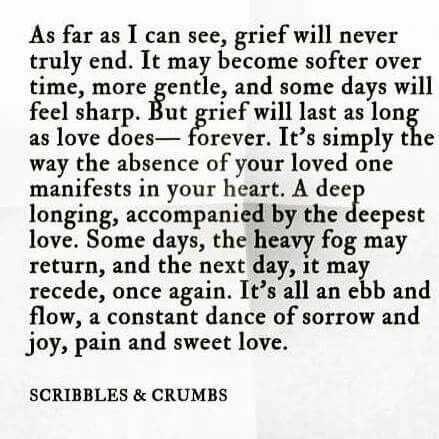 Grief comes in waves. Memories rise up and choke. Moments that are ordinary suddenly become heavy. Perspectives change. The first day after mom died both my husband and I looked at each other and said almost at the same time, "I don't think I can do this again. I would rather die first then face another death." We both are feelers...and at that point it felt like we would not be able to go through life facing any more inevitable loss. We would rather die ourselves...but then we thought of our children and of course roused ourselves up for some more life. 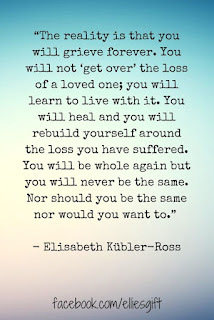 When my miscarriage happened I learned that closer people in our lives may not show up in our grief, and complete strangers suddenly are THERE. It's strange. 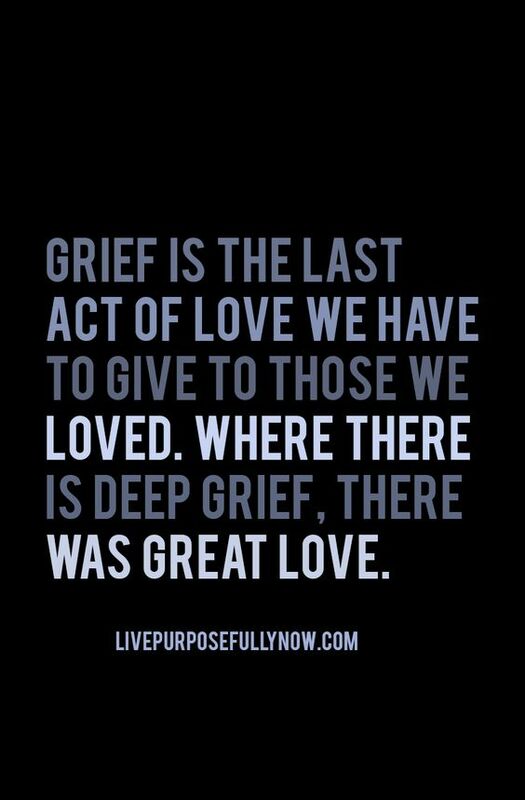 But I also learned that it's ok because some people just don't know how to be in grief...they can be there for us in other ways. Just like some can not be there for us in happiness...they are better at supporting crisis. We all have our gifts and I have learned not to judge those who do not show up as expected. There have been surprising people who have showed up at our door, brought nourishing food to our table, and written lovely texts, Instagram comments, cards and lovely little tribute gifts. Others showed up to the funeral even though they didn't know mom but they came to support US. We also had many offers from people to attend but we told them not to come on our behalf as we knew we wouldn’t really be represented much, plus, if they didn’t really know mom, we felt they could show up in other ways. The offers were beauty in themselves. Our tribe has pulled us through. My mom's neighbour, who is Greek and also a caterer, brought us authentic Greek Tasiziki (my favourite food! ), chicken, Greek salad, potatoes and a honey cake made within all of our dietary needs. I had a food afterglow for hours. I finally understood why some people want to eat all day. Nourishing food can heal parts of the soul. We literally tasted a bit of joy. And it was from someone we barely knew. We have had lovely emails from atheists and believers. Supportive offers of work or beers and loving emails filled with understanding. One friend who recently lost her mother gave my husband the voice he had been looking for. Her card was filled with words he needed to hear validating loss and the feelings that go along with it. Our therapist has been supportive, kind and has really pulled us through in many ways. I see him again tomorrow and am so grateful for his presence in our lives. 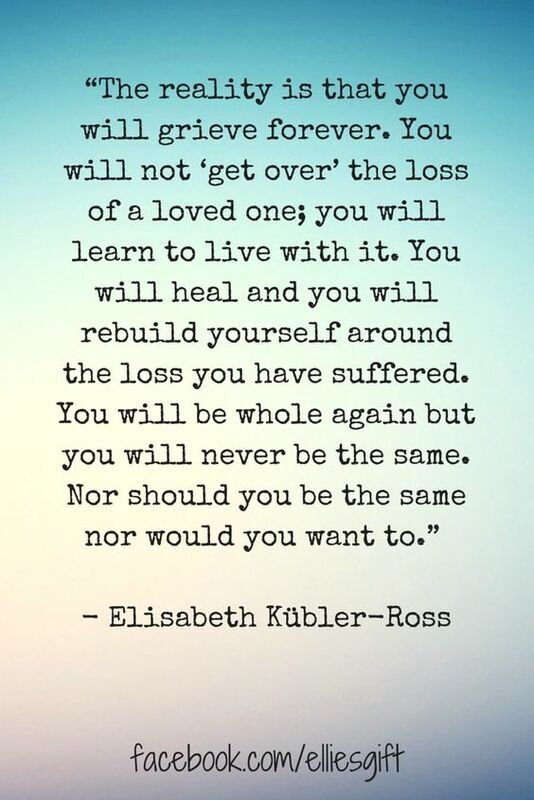 Friends from afar, connected through a private instagram feed, have listened to me vent out some of the process, grieve and post constant updates on mom before she passed as well as constant posts on funeral prep after. I use my instagram in a more personal blog ish kind of way and their likes and supportive comments brought us through some very dark days. Words can heal or tear apart. We were having our own fair share of pressure prior to the funeral and these ladies (and one guy) surrounded my husband with comments of anger on his behalf, support through their own stories in a way that allowed him to live his own, and general kindness. I can honestly say that the week before the funeral my instagram fellowship held me up. One fellow far friend had recently lost her mom and her support has been invaluable and irreplaceable. My husband's best mate has phoned many times and contacted me for my address to send out a care package. His support and companionship has been deep. He is a special soul in my husband's life. A friend we are just getting to know gave us gift cards to help cover some of our costs to the ICU (that we are still catching up on.) She also showed up later with little cast iron birds for each of us. She told us her own grief story and that when she held a iron bird in her hand and felt the weight she would feel a bit comforted, thus she bought us each one. I found that gesture not only touching but a piece of the mosaic of shared humanity. Sharing our stories and surrounding each other with our own fabrics to add to the picture. When one person runs out of red, another is there to add their maroon string. The picture looks suddenly different, a bit messy maybe, but so much more unique. Our neighbour a few doors down saw us on a walk two days after mom passed, walked out her door, gave us all hugs and offered to bring the next meal. Our kids have played together but otherwise we have not chatted too much and yet there she was. She brought us a well thought out meal within our dietary needs. Our friends that we met through our C2Q events showed up at our home with tickets to a Science Centre for our whole family and a bag full of groceries we could eat like organic milk, free range eggs, pure orange juice, Hard Rock chips, organic probiotic yugort, Gluten free pizza and even beer (to the delight of my husband:) On top of their generosity they also stayed for a couple hours and we spoke of deep subjects like death and beliefs in an open discussion based on sharing and beauty instead of conviction. A few hours after we were in ICU crying over mom's body, we had to travel back to the same city for groceries. We were exhausted and numb. We came home to find a lovely bunch of peace lilies on our table with a card, a salad in the fridge, and frozen gluten free pizza in the freezer. My best friend from high school had walked in because my grandma left it unlocked for her. I stared down at the familiar handwriting, known to me from grade five onward, thinking how surreal the moment was. The dreamlike state of the passing of time and the support from friends made long ago. How beautiful it is that we try to show up for each other still even if we rarely see each other. Her and my other dear close friend from High School texted me many times during the first few days leading up to mom's death and after. 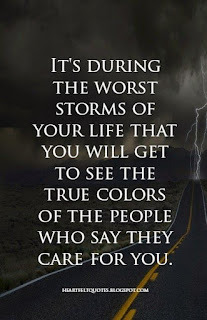 Their allowance of my venting moments, comments of support and how they just allowed me to be ME was priceless. I realized how much LOVE is infused in my life. I told them both they didn't have to show up for the funeral-it was a different sort of situation for us. While the other friend lived far away, her dad who was in town, came on her behalf and wept with my husband, gave him a touching card with heartfelt words and his daughter (my longtime friend) called me before hand. That is community. The friend who was in town ended up showing anyway at a time when I was sitting alone at a table with my children waiting to go into the memorial. The entire family had broken up to groups around us. All the little cousins were at the other table and had deliberately left my children out. One told my youngest he was too little to be with them...and my youngest was in grief mode. I heard the tail end of it and went to my kids and started talking to them cheerily about their outfits and how proud I am of them. Inside I was feeling isolated, irritated and very much hurting for my kids and for other reasons. Suddenly I look up and there she was, one of my oldest and dearest, standing there. I didn't even recognize her at first but it clicked while she was already hugging me. Her hug felt like home and I generally hate hugs but with some people it just is HOME. Maybe my high school friends hugs are that way because they have witnessed so many key moments? 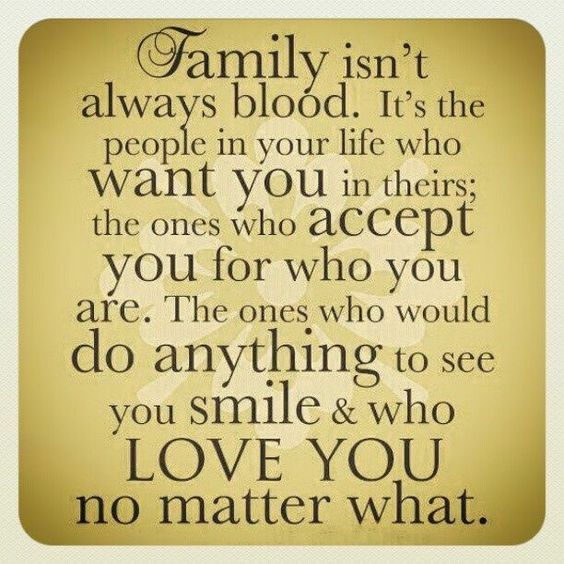 I was SO relieved to see a friendly face in a sea of family who barely knew me at all. I almost wept all over her but I knew I would never recover so we smiled, joked a bit and then she went to find a seat. The day my friend dropped off the food and flowers, my grandma had also cleaned out my fridge and freezer, tidied up my house and put a meal in the crock pot. She made a few stops in the next few days to make sure we were ok and always tidied up a bit. Her help was priceless. She just showed up. My grandma is a crucial part of my world and like a second parent to both my husband and I and our children. We would be lost without her. My other grandma called from far away with tears in her voice and deep condolences. In the mail yesterday I found an envelope with a fifty dollar bill wrapped up in calendar paper and tape in my grandmother's unique way. I wept as I read the familiar handwriting and wished for more time for everyone. Mostly I wished I was a child again back on my grandma's lap, not knowing grief and feeling only safety. I wanted to see her, touch her and talk to her. Death has a way of both stopping time and speeding it up at the same time. The Godmother of our children and a deep friend of both my husband and I came to our house before she left for Liberia again. She hangs out with us a lot when she is home from her exotic travels and advocacy work. We go way back to school years too. She brought us a gift and paid for gluten free take out when we couldn't even think straight. She cried with us a bit and then we all watched 'Thor the Dark World' because we wanted to escape into our nerdy world for a bit and movies are always better with someone who has not seen them yet. The night we went up to the ICU and mom died on our way up, our friend had dragged herself out of bed and came to stay with our children. She left when we got home around three in the morning to give us time alone to tell the kids their grandma had passed. Because she could not be at the funeral due to her job travels, her mother attended for her and for us. When her mom came up to my husband after the funeral with words of wisdom and comfort my husband started to cry. There were MANY people who talked to my husband that day but only three who had him crying. He told me later, "There was something different about her presence. It was nurturing. She didn't give empty words or tell stories. She validated something. There was something raw and real within her words. I just felt different in a good way and it was a moment I appreciated deeply." At the funeral my husband's work team surprised us, taking the day off, dressed all spiffy in their suits (which is a huge contrast to their construction garb) and sat through the entire religious aspect of the service, even though they share many different forms of belief amongst them. They are also a range of ages and each one of them showed. My husband's current contracting boss/manager has been a mentor and friend. He has had breakfasts with my husband, supportive 'man fires' and showed up at our door to discuss, support and given us all the time we need to get back to work. Another sweet friend of mine showed up for the funeral and came to chat with me a couple times after the memorial. I was so nauseous from lack of food and too many people. Because I was comfortable with her, I confided this fact. It was a relief to be myself for awhile. She fished in her purse and brought out a mint. It was the first mint I had in over three years...my first processed sugar but she encouraged me to just take it. I am so glad I did. It literally saved me for the next two hours. Maybe it helped spike my blood sugar, maybe it was nice to get the bad taste out of my mouth, or maybe it was just her kindness...or a combination of the three, but regardless it was a high point for me in a chaotic time of handshakes, condolences, prayers and other's pain stories. Also, seeing her beautiful face helped carry me through. She stopped by later for a visit and a bag full of good things like dried dill, organic bananas, oranges and dark salted chocolate. It was lovely. Near the end of the memorial my sister in law came to say goodbye. She shocked me by kneeling down beside me and giving me a hug as she left. It seemed so genuine and really- I wasn't in her path. She could have avoided me. She could have just pretended she didn't see me and left...and yet she swung by with her stroller and said, "Well, I'm out. I'm done." Here is what I like about her...she has her moments of honesty that I completely agree with deep down with no shame in saying it bluntly. While my harmony co pilot (see personality hacker INFJ click`car model) usually has me presenting similar thoughts slightly differently, the same sentiments are inside of me. I laughed and said, "I am so done too...we are hopefully going to go home soon." And I felt slightly baffled and endeared to her. Relationships are messy. While ours is not one that would go down in the history books as completely understanding, there is something, at times which grows both of us. It has been an effort but at times there is camaraderie. We probably also view duty in different ways. Her duty is focused more to extended family and systems, how things should be, roles, image, faith, rationality...and my duty is often focused on harmony, aiding the suffering, grace, honesty, vulnerability, and feeling orientated- so more communication is needed. Maybe our connection is our collective intuitiveness used very differently or our united introversion? Both of us know in our own different ways what mothering is like in a special needs family. Regardless her hug was a moment I know I will forever see in my mind's eye and one I will appreciate, despite the fact that we still had isolating events, where our perspective wasn't seen, with the family collectively after. There still was beauty. Our mom's sister and our aunt has been our companion in grief, our encouragement and our little piece of mom with us. She has shared meals and moments. The night before the funeral she came and watched two episodes of Gilmore Girls with us. She had never seen it which shocked us. A world without Gilmore Girls is a little sadder...it's our family's favourite show! :) It was the perfect way to escape for awhile even though the heaviness of grief stays. My husband's aunt and uncle came over to see our house. We spent an hour or so rehashing memories of mom that had us missing her deeply and teary eyes mixed with hearty laughter. It was a sacred moment. Even though they are missionaries, they surprised us with the lack of statements and instead it was raw emotion, real sharing, and vulnerable discussions over millet peanut butter cookies my son had baked. My husband's dad has shared tears and vulnerable moments. With my husband he has grieved and become closer. Ironically, our dirty van unexpectedly led the procession to the graveside. Dad's vehicle was especially cleaned for that moment but his keys went missing...and we were next in line after the hearse and limousine because my husband was a pallbearer but wanted to drive with me. Suddenly dad was in the car and we were frantically throwing garbage from the front to back so he could sit next to my husband. We pulled in between the hearse and the limo. It was funny on so many levels because the 'rebellious son' and the one who is often alienated was leading the procession in a hillbilly ish sort of vehicle. At the funeral a few people asked my husband how he was related to the deceased. We keep a low profile. 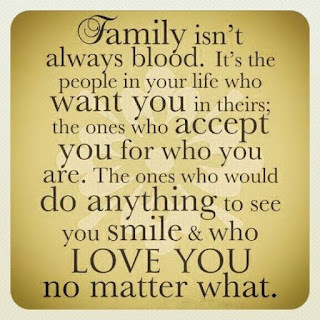 We value our privacy and while we do speak out, we are not known as part of the family unit usually (for many reasons- some previously discussed in other posts.) Luckily, my husband was in a good mood funeral day, it was probably the easiest day of the week for him, so he laughed at their shocked/dismayed expressions when he said he was her son. My parents (who have been gone this entire time) and other relatives have made calls of support and sent texts of love. Because my parents have been gone my best friend has gone over and beyond for us. She made us a yummy gluten free chicken finger meal and took the kids to her house to eat so we could watch the new Star Wars. She also had my children after the memorial and has taken them at other times too. She has listened to me cry, vent out family drama and allowed me to speak freely about anything and everything. Most of all though, she attended the funeral WITH us. She sat amongst sixty plus tightly knitted family members. She walked into the memorial with us even though she didn't belong with the family. Because we asked her to. Because she is a witness to our lives. Because she IS our family. Because she understands the pressure of beliefs and did not want us to walk through that on our own. Because she knew I would have to discuss it all with her and it would just be easier if she witnessed it herself. Because she loves my children like her own in many ways and wanted to be there for them. And because she knew what a loss this was for us on a deeper level than most knew or would understand. But she did. Words are not enough. I feel I will forever be indebted to her. I cannot lose her. She stood beside us. She sat with us during hymns when everyone else stood. She stood out WITH us. She was brave and that bravery stemmed from love. She understood and that was everything. All of these people have kept in touch when needed and also given us space when needed too. I missed so many faces at the funeral that were there for us and I am thankful for each of their support. I am awed by our little community. One of our family members mentioned that mom lived a legacy because of the amount of people who showed at her funeral. I disagree. Mom WAS her own legacy. If even one person showed up who deeply mourned her she would have lived well. She was an extrovert and an entertainer at that- of course she will have hoards of people who felt like they knew her personally. She was a fun, kind, outrageous, generous person. Regardless of those who showed up- she was her own legacy that we carry on in our own small ways. Someone also mentioned a little child who had died and how grateful we should all be at the time we had with mom. We ARE grateful. 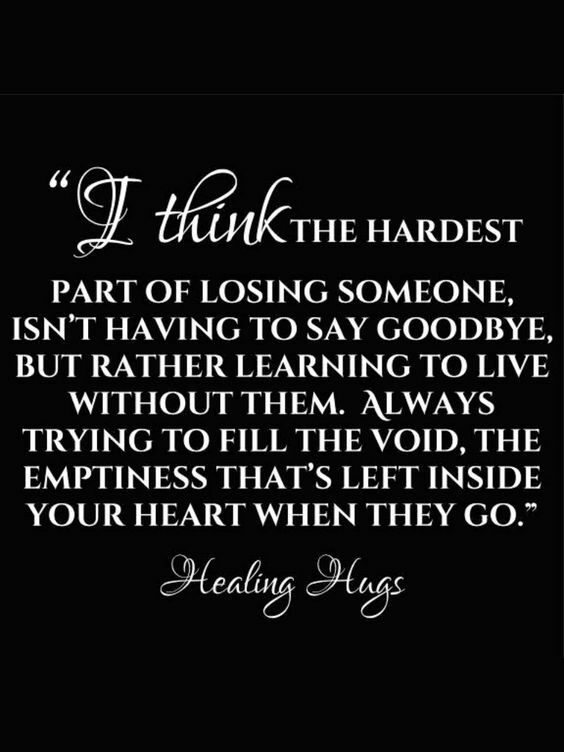 Yes the younger life is taken- the more tragic it seems to be, however, comparing grief is ridiculous. 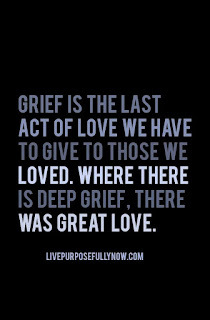 There are so many different ways to grieve. So many horrid ways to live. Many moments that are meant to be mourned and each one will be it's own sort of heartache. I had a friend text who had just broken up and she didn't want to bother me in my fresh grief. It was considerate but I said, "I like to be a support…it's good for me too and I would love to be…I know today I am not in a good place ( I sent a post) but either tomorrow afternoon maybe or whatever I would love to get back into life and friendship appropriately which means give and take and I want to hear your story. Every grief is real and needs support and life is for the living…part of our stories are in our hardships and there are worse things than death…worse heartbreaks even though death is horrid and final. I am sorry you are having your heartache moment." She has been there so many times for me and I still want to show up for her. There are sweeping moments of grief and there are more balanced moments. I went over to help set up some food on behalf of my husband and his family before the funeral. At one moment, I was doing the veggie tray alone throwing on veggies and getting frustrated at how I do everything messily. Suddenly I was hit with memories. Mom was my partner in crime and since reading about Autism and Dyspraxia, she seemed to know when I was feeling inadequate or disabled in a way. She would come beside me and messily throw things on and joke, "Who cares?! Everyone is gonna eat it anyway! I could never make this look perfect." And then she'd smile at me give me a pat as she knew I didn't love hugs and make another comment to make me comfortable. She was the one person in the family who tried so hard in my languages. I tried in hers too and it was a beautiful dance the last few years. I miss her so already. I already hate going to her home because it feels so empty. I feel deeply for her spouse. The picture above was taken when I came home after the veggie tray. I held in my emotions but when I came home I sat and cried as memory after memory of her hooting laugh and loving support the last few years came crashing around. For my husband there is so much more to it. 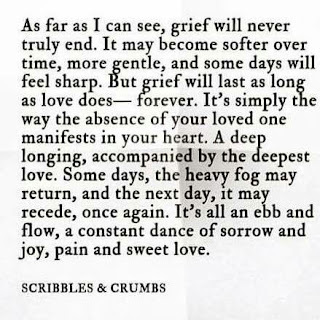 Grief is debilitating ...but in it there is some beauty. The beauty of human love, raw feeling, and vulnerable communication...of being ALIVE because life is for the living but it is also ok to mourn what was lost and living before. Thank you for being part of my witness and in that my beauty. That was really beautiful, I'm always so struck with how you express yourself. Ever thought of writing a book? It'd probably only take you a month or two!- S.A.
Just read your post. I'm SO happy to read of such incredible support and gestures of love. Just. ...yes. Also, the whole story of your van leading the procession made me LAUGH! (Chucking garbage, rebel son, etc). Thinking of you in the season ahead and the many colors of grief to yet process. Yes! I am so thankful for all of those who have supported us. Mine and your friends. My workmates, who are really my family. However, I am most thankful for you, my strongest support. You have helped me in ways I thought were not possible all the while you were grieving as well. You amaze me. The children have also been fantastic. 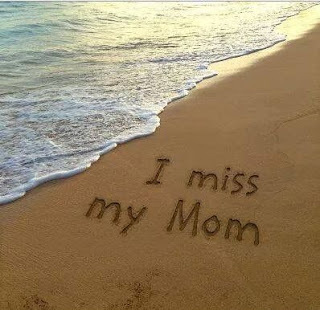 I miss my mom, but what I have lost in losing my mom, I have gained in you and the kids. Your the best....Around! S.A. thanks. LOL so many people have asked me that- ultimately I think I am too disorganized and wary of business ventures and lack of freedom to write a book- mostly just too procrastinating...Yes...When I compiled many years of writing I had about 4 books worth but once edited would only be one- but I hate editing! I don't know if you noticed but I tend to edit my posts hours after I published them...I hate it so much:) Thanks for being such a support to us. Y'all really needed it after the fiasco of the last post too. Kind of strange how everything always balances out. First you went through the really embarrassing, face-palming, dark side of humanity, and then the more lovely and kinda saintly side of humanity with the well wishes and good eatin'. 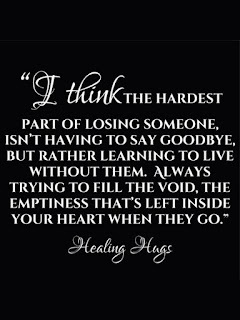 I hope from here on out y'all only have the latter kind to deal with until the grieving process is over. Not yet, but soon. I need to make a proper RSS feed or something.